Depression glass is widely collected the world over and many patterns are still plentiful enough to keep prices reasonable. There's also a color and pattern available to suit every taste. Collectors can look for common Depression glass patterns, each of which is distinct and some offering more ornate details than others. Also, you'll generally find that saucers are more common than cups and represent about one-quarter of the value of these sets. Values provided in this guide are for glassware pieces in excellent to mint condition unless otherwise noted. Pieces by MacBeth-Evans Glass Company are rather common. The beautiful pink glass such as that used in the piece above can be found in plates, bowls, pitchers, and all sorts of tableware. This particular American Sweetheart cup and saucer was produced around 1930 to 1936. The set in excellent to mint condition generally sells for around $10 to $15, though the value has been known to fluctuate. For instance, in 2006, the set was valued on eBay for $16 to $25 and in 2008 Austin Antique Mall had it valued between $12 and $15. Monax is the name MacBeth-Evans gave to the company's milky-colored glass. Though it looks similar, this glass is much thinner than what is known as milk glass. The American Sweetheart Monax sherbet dish was made between 1930 and 1936. Alone, the dish is typically valued between $10 and $13. When it's sold with the matching dessert plate, the value is in the $20 range. It's also common to find sets of four to six sherbet dishes. The Aurora pattern was issued only as a breakfast set, so the number of pieces in the cobalt blue glass collection is limited. This cup and saucer set was produced by Hazel Atlas Glass Co. in the late 1930s. It's common to find the cup and saucer valued between $10 and $20. There are also full sets of four to six cups and saucers that come up on the market from time to time. There are three styles of Block Optic sugar bowls, all with similar values. One is a stout mug-like shape, one a footed bowl, and one a taller footed cone. They can be found in green, yellow, white, pink, and clear glass, sometimes with the matching cream pitcher. This green glass piece is the cone shape. It was made by Hocking Glass Company around 1929 to 1933. In 2006, eBay sellers were valuing them around $15, and that dropped to $5 or less by 2008. More recently, the sugar bowl alone has been selling for $10 to $20 and in the $30 range with the creamer. Cups in the block optic pattern were made with a number of different handle styles. The values are similar for all styles. Produced by Hocking Glass Company around 1929 to 1933, this green glass cup is a common find. The value has generally held steady around $5 for a single cup for a few decades. The Hocking Glass Company's Block Optic green luncheon plate dates to between 1929 and 1933. Generally, a single 8-inch plate will be valued between $5 and $10. Produced by Hocking Glass Company around 1929 and 1933, this piece is an 8-inch green pitcher in the Block Optic pattern. It holds 80 ounces, so is on the large size since it's more common to find 54-ounce pitchers. There are a few different shapes as well. In 2006, this pitcher was valued on eBay for $100 and that has stayed steady through the years. Other green pitchers of this pattern can be found around $30 to $60. Also dating between 1929 and 1933, this sherbet dish was made by Hocking Glass Company. It features the Block Optic pattern in green glass and has consistently retained a value of $4 to $5 for a number of years. You can also find sets, ranging from two to six dishes with similar values per piece. The Hazel Atlas Glass Company marketed this cobalt color of glass as Ritz Blue. The cream and sugar set has a chevron pattern and was produced in the 1930s. This set is typically valued between $10 and $20. You might also come across a larger milk pitcher shaped like the creamer. The Colonial Block pattern seen in this goblet is often confused with the Block Optic pattern. Produced by Hazel Atlas Glass Company in the early 1930s, this piece has been shown in Depression glass books in the past for $75. However, this tumbler is generally too common to bring that price. Instead, you can expect to find them valued in the $10 range. Dating between 1934 and 1936, this colonial butter dish was made by Hocking Glass Company. The green glass dome is a unique and ornamental shape that is sought by collectors. While it was valued around $35 in 2006, more recent online listings show an asking price between $40 and $70. You can even find the dome alone if you need a replacement. Made by the Jeannette Glass Company from 1929 through 1933, this "Cube" pink Depression glass butter dish was inspired by the Cubist art movement. The dome is the most valuable part of the dish. The plate alone is often valued around $9 while the two pieces together sell for around $40. The Georgian pattern of Depression glass is occasionally referred to as the "Lovebirds" pattern. This 3-inch footed sherbet dish made in green glass is from the Federal Glass Company and is dated to 1931 to 1936. In 2008, the lone dish would be valued at around $6 and you can still find them for that price. However, it's more common to see recent asking prices double that, ranging from $10 to $15. The Hobnail pattern has a pattern of circular bumps that surround the piece. This pink footed sherbet dish in the pattern is from the Hocking Glass Company and was made between 1934 and 1936. Generally, a single dish sells between $5 and $10, and it's possible to find up to six matching dishes in a set. Corsage is the term to describe Iris pieces decorated with red and purple flashing, and gold trim. This 3-ounce crystal wine glass is from the early Depression era, dated between 1928 and 1932. Made by the Jeannette Glass Company, it is not as common as iris wine glasses in plain glass, so a loan glass could be sold for $25 or more. The iris was a common flower in Depression glass and it's seen here on an iridescent butter dish. This eye-catching piece was produced by the Jeannette Glass Company between 1928 and 1932. The dish alone may sell for $10 and the complete set with the domed lid can be found in the $25 to $50 range. The Hocking Glass Company made a couple different Mayfair "Open Rose" relish dishes in a beautiful blue glass between 1931 and 1937. The more common one is a 10-inch oval two-part dish. This round piece is a little rarer, divided into four parts and measuring 8 3/4 inches in diameter. While the oval dish sells for around $35, the round ones can bring $45 to $70. Clean lines make this vintage piece perfect for a modern home. The Monderntone cream soup bowl was made by Hazel Atlas Glass Company in the later Depression-era years, between 1934 and 1942. It was also made in an amethyst-colored glass as well as semi-opaque glass called Plantonite in a variety of colors. Cobalt blue glass pieces like this are common, but the value has gone up. Where it was valued around $5 in 2009, recently sellers have been asking between $15 and $30 for a single bowl. Also in the Moderntone pattern by Hazel Atlas Glass Co, this cup dates to 1934 to 1942. The cup alone has held a value between $5 and $7 for a number of years. With a saucer, it may sell for around $15, and it's common to find complete sets of four to six together. The Patrician pattern is also occasionally referred to as the "Spoke" pattern. This amber-colored glass cup is from Federal Glass Company's and was originally marketed as "Golden Glo" when it was produced between 1933 and 1937. The price has held steady in recent years. This single cup was valued around $4 in 2008, though you might find it up to $7 today. With the matching saucer, it can bring between $10 and $15 and it's not hard to find a full set or matching dishware. The lacey edge on Old Colony pieces damage easily and should be checked carefully for chips and cracks. This pink glass vase or bowl includes a "frog," which describes the insert used for flower arranging. Made by Hocking Glass Company between 1935 and 1938, it's often valued between $30 and $40 in excellent condition. The Hocking Glass Company made this pink footed tumbler from 1931 to 1935. It stands 5 1/4 inches tall and holds 10 ounces. The value varies greatly depending on the condition, seller, and venue, so you'll find a single glass anywhere between $15 and $50. The Queen Mary pink cup is dainty and beautiful. Produced by Hocking Glass Company from 1936 through 1949, they're very common on the antique market. A single cup can sell for $2 to $5 and reach $10 with the matching saucer. There are two sizes of small Queen Mary bowls or nappies without handles. This size, which is the most common, is a little larger than the berry bowl and measures about 4 1/2 inches in diameter. These bowls were made by Hocking Glass Company from 1936 to 1949. While they sold for $5 and less in the 2000s, today it's not uncommon to find a single bowl for $15. However, sets do tend to retain that $5 to $7 per piece price. Sherbet plates, also known as bread plates, are easier to find in the ribbed Queen Mary pattern than saucers with cup rings. Because of that, they are often used for a more affordable substitute. These were also made by Hocking Glass Company from 1936 through 1949. These were so common that in 2006 a single plate was valued at around $2. More recently, they tend to have an asking price around $10. Hazel Atlas Glass Company made this Royal Lace green creamer from 1934 through 1941. It's not extremely common, though can be found rather easily, sometimes still with the matching sugar bowl. It's often valued around $30, though the pair tends to bring just $40 or so. 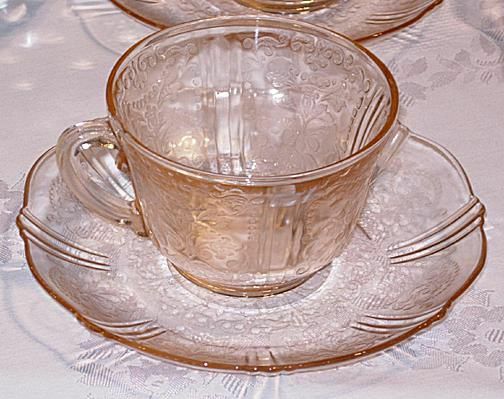 The Royal Lace pattern was used to make glass dishes in a variety of colors, including green, clear, pink, and blue. Made by Hazel-Atlas Glass Company between 1934 and 1941, 9 7/8-inch green plates like this tend to be valued around $20 a plate. The other colors are similarly valued. This particular vase measures 6 inches tall, but the height can vary somewhat from piece to piece. It was made by Jeannette Glass Company between 1937 and 1938. Pink is not too common of a color in the Petal Swirl pattern, and you're more likely to find it in ultramarine green. This pink vase was valued at $17 in 2008, though that has likely risen since considering the more common green vase is often listed around $25. The Windsor pattern has nice geometrical texture and this pink glass pitcher is rather common. Made by Jeannette Glass Company from 1936 through 1946, it was valued between $25 and $35 in 2008. You may still find pieces at that price, but it has more often dropped to $15 to $25. The Windsor tumbler from Jeannette Glass Company stands 4 inches tall and holds 9 ounces. Produced from 1936 through 1946, this pink Depression glass piece in excellent condition can be sold for $10 to $17 on its own. Which Fire-King Pattern Do You Have?